Users with admin access can set up which fields appear when users manually create contacts, companies, deals, and tickets in HubSpot. Users with admin access in Sales Hub Professional or Enterprise accounts can make certain fields in contact, company and deal creation mandatory during manual creation. Users with admin access in Service Hub Professional or Enterprise accounts can make certain fields in ticket creation mandatory during manual creation. For contacts or companies, in the left sidebar menu, navigate to Contacts & Companies. For deals, in the left sidebar menu, navigate to Sales > Deals. For tickets, in the left sidebar menu, navigate to Service > Tickets. Click Manage next to Set the properties your team sees when creating [objects]. If it is your first time setting up, in the dialog box, click Start from default properties to include your current default properties or click Start from scratch. In the left column of the dialog box, select the checkboxes next to the properties you'd like to appear when a user creates the object. 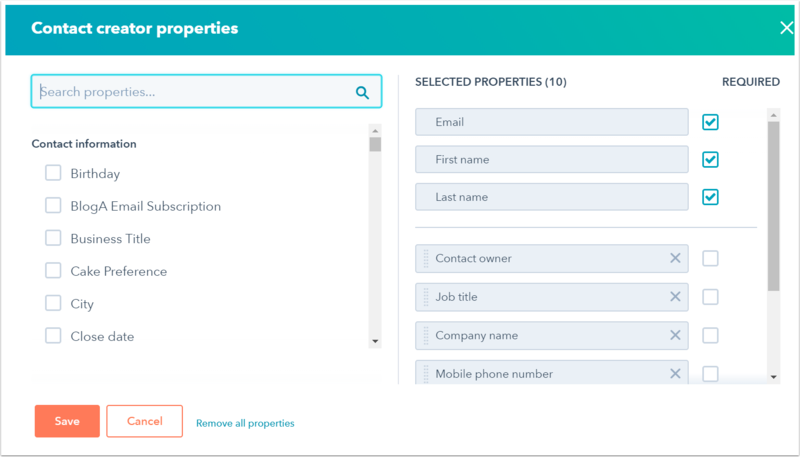 In the right column, click and drag the properties to reorder them. For Sales Hub Professional or Enterprise accounts, you can select the checkboxes in the Required column next to properties you want to make mandatory when users manually creates a contact, company, or deal in HubSpot. Users will not be able to manually create a contact, company, or deal, without entering these required properties. 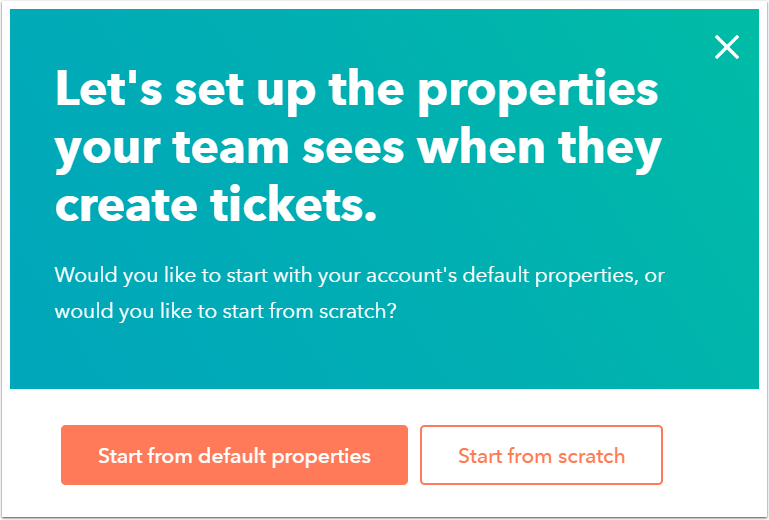 For Service Hub Professional or Enterprise accounts, you can select the checkboxes in the Required column next to ticket properties you want to make mandatory when a user manually creates a ticket in HubSpot. Users will not be able to manually create a ticket without entering these required properties. Please note: certain properties will always be required (e.g., Email for contacts, Deal Name for deals).